Once the stately home of Prince Eugene, a painter, who was born with an artistic talent, but also under the Royal spotlight, and from birth destined to play the role expected of him. He became a skilled painter and even his father, the King, grudgingly had to acknowledge this fact. By the end of his life, his home and vast collection of art was donated to the State in order for it to be enjoyed by the public. Prince Eugene undeniably had good taste, which is evident from his beautiful house. 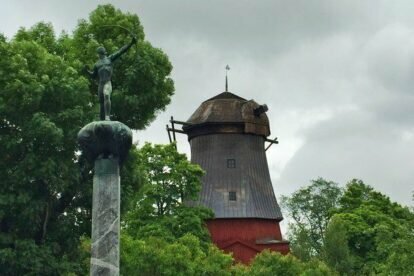 But as much as I enjoy going to art exhibitions in his former home, now a museum, it is the garden and park that I find to be the main draw to Waldemarsudde. Overlooking the harbor inlet of the city, the main thoroughfare into Stockholm for centuries, the Prince had a great panorama to enjoy. “After art, I think flowers are my greatest joy”, wrote the Prince in a letter to a friend, which becomes evident when walking in the beautiful park surrounding the house. There are several sculptures to admire, perhaps the most famous of these, August Rodin’s the Thinker. Monsieur Rodin created several versions, the one in Waldemarsudde being one of the earliest versions and most sought after by collectors.